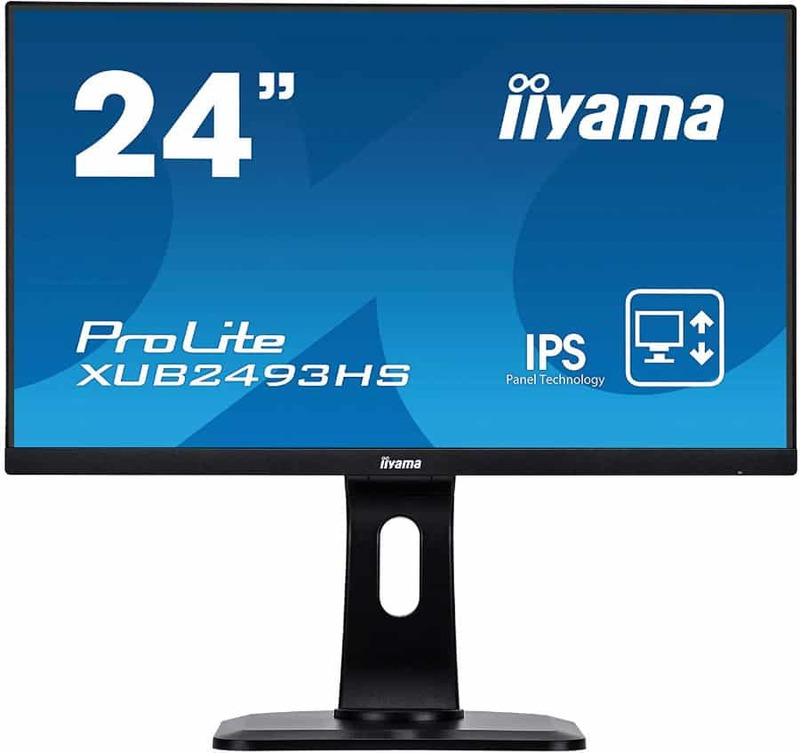 The Iiyama ProLite XUB2493HS-B1 offers a familiar 24-inch format coupled with a high-quality IPS panel which makes it ideal for typical usage scenarios. This model isn’t a highly-specialized variant, but the brand is advertising it for designers rather than mixed home and office use. The Iiyama ProLite XUB2493HS-B1 is slightly pricier than other offerings with similar specifications, but can its capabilities justify every buck you have to spend? The Iiyama ProLite XUB2493HS-B1 is an all-business display as denoted by the ProLite branding, so it comes with a sleek and simplified design. The monitor is all matte black so it will look less conspicuous than other offerings. What’s great about it is its bezel-free on three sides to maximize the view and make it very ideal for multi-display setups. The package includes most of the cables you will ever need, so setting the monitor once you break it out of the packaging is easy as peas. Build quality is excellent as expected since the device does not display any sort of creaking or uneven seams. 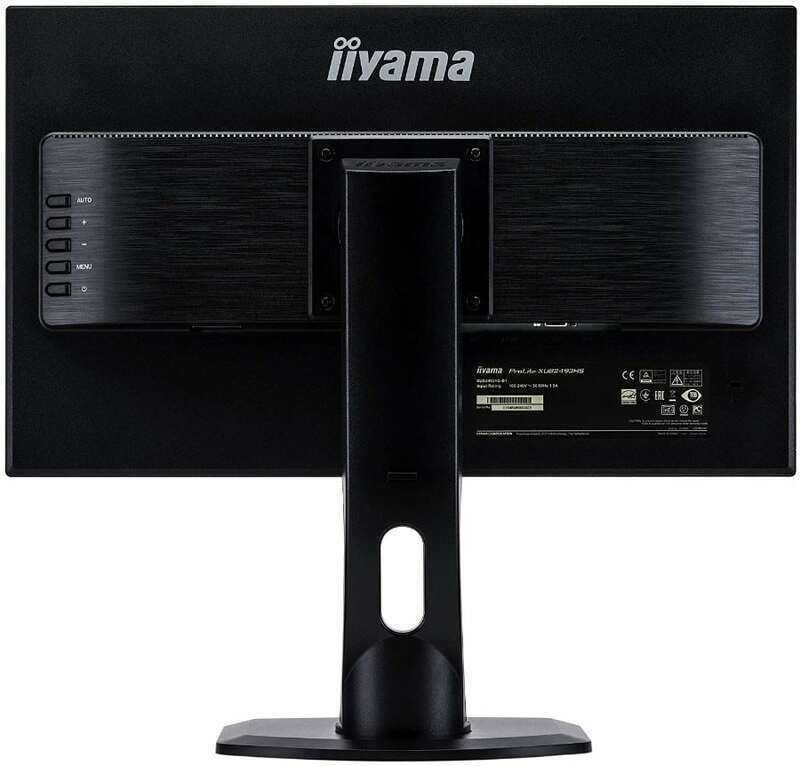 The Iiyama ProLite XUB2493HS-B1 stands stable once placed on a desk thanks to its ergonomic stand. The mechanism on this device offers excellent adjustability so users can easily set the perfect view angle. You can tilt, swivel, and pivot the device, as well as adjust its height, making it great for taller users. You can also remove the stand to reveal 100 x 100 VESA mounts for wall or desk mounting. One thing we dislike is the use of OSD buttons which is considered stone age by today’s standards. Don’t get us wrong, the five are clicky and protruded sufficiently to make access easy, but it’s just less convenient than a joystick or a remote. Since the layout is placed away from view, some users might struggle to get the hang of each button’s functions, especially in the dark. The Iiyama ProLite XUB2493HS-B1’s I/O payout is sufficiently equipped for most needs, plus a bit more. The panel includes DisplayPort 1.2 and HDMI 1.4 for video inputs along with a VGA connector for legacy systems. The addition of a pair of 2-Watt speakers with audio passthrough jacks is a nice touch, but it isn’t powerful enough for entertainment purposes. The Iiyama ProLite XUB2493HS-B1 includes a 24-inch IPS panel with a 1920 x 1080 resolution, 75Hz refresh rate, and 4ms response time. A contrast ratio of 1000:1 is specified along with a 250cd/m2 backlight that is sufficient for the product’s intended usage. These specs are nothing new, but Iiyama claims that this device is suited even for photo editing thanks to its imaging output. Testing with a DataColor Spider reveals interesting results for the Iiyama ProLite XUB2493HS-B1, although they are not that special. The monitor can only cover the sRGB color space for up to 97% which is decent for daily use, but a bit short compared to other pro displays. Complicated tasks such as color grading will require an Adobe RGB-capable display which has a larger gamut volume. However, what makes the Iiyama ProLite XUB2493HS-B1 true to its ProLite branding is the display’s color accuracy. The Spyder Elite V produced an average Delta E of only 1.0 which is fantastic for a budget display. We wish the gamut was a bit wider to make this monitor a cheaper rival to the ViewSonic VP2468 which is costs at least fifty bucks more. The Iiyama ProLite XUB2493HS-B1 struggled to reach its maximum 250cd/m2 brightness when the backlight could only produce 230cd/m2 at 100%. That isn’t so bad since daily usage doesn’t blinding levels of illumination, although a higher output will be helpful in well-lit environments. Another flaw that’s native to Iiyama monitors is the peculiar Gamma settings which result in different levels. Gamma 1 sits closer to 2.1 while Gamma 2 hits 2.3, But Gamma 3 drops it down to 1.8. The progression is strange, so for all intents and purposes, we recommend users to apply Gamma 1 for dailies and Gamma 2 for gaming. The review specimen of the Iiyama ProLite XUB2493HS-B1 displayed decent results in panel uniformity. Color variance stayed within DE 3.0 from the D65 standard on all quadrants, so no strange shades will be readily visible. Brightness uniformity is just as good, although there are some leaks at the bottom of the panel. Make sure that you stay below 50% brightness, since setting it too high will make color imbalances more visible. This limitation is natural for this panel technology, and it would take a miracle to get something that is perfectly even. Take note that this aspect may vary between unit to unit since no two IPS panels are made equal. The Iiyama ProLite XUB2493HS-B1 is decent for casual gaming especially since most budget to midrange GPUs can run its resolution and refresh. The extra headroom from the 75Hz refresh rate handle on-screen motion, so blurring and ghosting are less of an issue. There are some artifacts or trails here and there, but only a 144Hz display can change that. The Iiyama ProLite XUB2493HS-B1 is also responsive enough not to add a feeling of delay thanks to its latency of only 12ms. E-Sports athletes typically want something faster, but this monitor should be good for a few rounds of after-hours enjoyment. The Iiyama ProLite XUB2493HS-B1 is surprisingly very capable when it comes to professional applications thanks to its amazing color accuracy. The gamut coverage isn’t as wide as we had hoped, but the device is still recommended for light editing or RGB graphic design. Gaming performance is decent at best, but only specified 144Hz models can be better and more responsive. But what we love about the Iiyama ProLite XUB2493HS-B1 is its price which is just a few bucks more than the vanilla 24-inch 1080p displays in the market. The product isn’t perfect and some of its settings like its Gamma could use some work, but it offers excellent value. If you are in the market for an accurate display that won’t break the bank, the Iiyama ProLite XUB2493HS-B1 is a top choice. Just the monitor I need. Thanks, Jojo! We’re glad you liked our work. Cheers!